Medical Media Images Blog: What is Cauda Equina Syndrome? What is a “Cauda Equina”? The word “Cauda Equina” is from the Latin terms “Cauda” meaning “tail” and “Equine” meaning “horse”. This is due to the appearance of the spinal nerves below the spinal cord. When seen on an MRI, this bundle of Spinal Nerves has the appearance of a “horse’s tail”. The spinal cord often ends at the L1 or L2 levels, however the spinal nerves of L3-S4 continue down the spinal canal as the “Cauda Equina”. The Image below is a Color MRI Image which shows the Spine Anatomy including the Cauda Equina. This Image is interactive. Just move your mouse cursor over the Image to learn about each part of the Anatomy (if the interactive image tags do not load properly due to slow browser speed, just refresh the page). Cauda Equina Syndrome is a condition where there is an acute loss of the function of the lumbar and sacral spinal nerves, below the level of the spinal cord, i.e. the Spinal Nerves of the Cauda Equina. This can cause permanent paralysis and is considered a neurological emergency, which may require emergency surgery. How do patients get Cauda Equina Syndrome? The next Image is also interactive and shows a case of severe Spinal Stenosis (narrowing around the Spinal Nerves). Notice how the Stenosis places pressure on the Cauda Equina. Interactive Color MRI showing severe Spinal Stenosis which places pressure on the Cauda Equina. Spine specialists combine the information gained from the patient history and that from the physical examination and special tests to make the diagnosis of this disease. A history of a sudden development of neurological problems of the bowel, bladder and legs is highly suggestive of Cauda Equina syndrome. X-Rays are most useful if trauma is suspect to be the cause of the Cauda Equina syndrome. Spine fractures and dislocations can be seen. CT-Scans can be used to see the bone anatomy of the spine. In combination with a myelogram it can show compression of the Cauda Equina. However, the spinal nerves, spinal discs and spinal cord cannot be directly visualized. MRI scans are the study of choice to diagnose Cauda Equina syndrome. 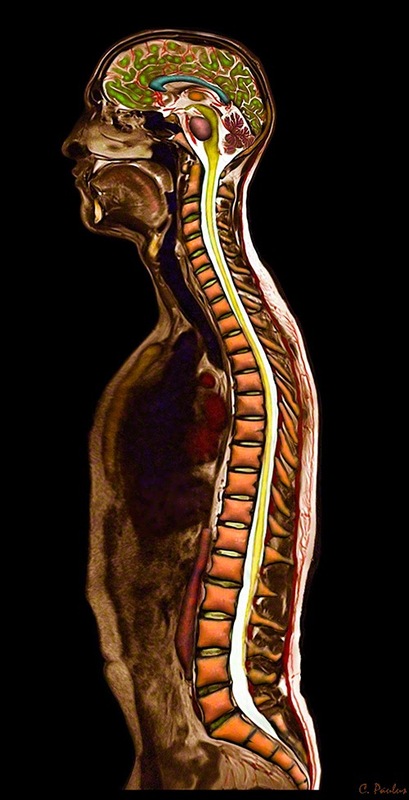 The contents of the spinal canal (spinal nerves, spinal fluid, spinal cord, epidural contents) can be directly visualized. Often compression of the Cauda Equina is clearly seen. The treatment of Cauda Equina syndrome is typically surgical. The compression of the Cauda Equina has to be relieved quickly before permanent damage to the spinal nerves occurs. Surgery should be performed within 24-48 hours of the onset of the symptoms. The most common surgery performed for this condition is a Lumbar Laminectomy Decompression. This surgery removes the lamina bone from the back of the Spine to relieve the compression of the Spinal Nerves. Once the Cauda Equina is visualized, the underlying cause which led to the Cauda Equina Syndrome can be repaired.